Weighing only 2.2 pounds, the PIN138 delivers impressive durability with an aluminum body and magazine construction. 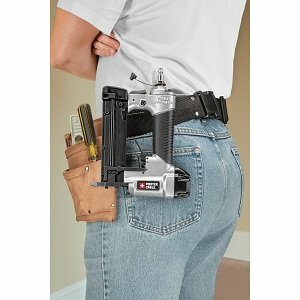 The reversible belt clip allows the user to keep the tool by his or her side for when it is needed. This tool is ideal for cabinet makers, cabinet installers, furniture builders, and mantle builders. The PIN138 is appropriate for light fastening and clamping applications including, but not limited to, small trim and small decorative moldings, cabinet crown molding, raised panel doors, rope and bead molding, mantle building, and wood joining. Additionally, the nailer has the ability to fasten materials that would normally split when using larger tools, providing greater flexibility and time-savings on projects. 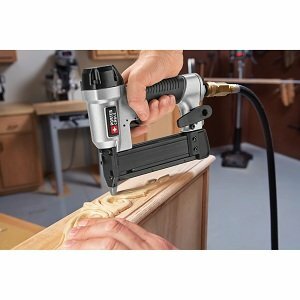 Designed with a maintenance-free long life motor, the Porter-Cable PIN138 23-gauge, 1-3/8” pin nailer requires no oil to be added to the tool. The motor utilizes a dual-stack ring system where the outer ring is designed to minimize internal friction, resulting in longer tool life and eliminating the guess of how much oil needs to be added to the pin nailer. The improved motor design helps reduce the possibility of work surface oil contamination and promotes hassle-free tool operation. The consistent power and penetration of the PIN138 is delivered through an internal piston catch that holds the piston-driver assembly at the highest position in the cylinder, resulting in maximum power on each shot and ensuring accurate nail setting. The PIN138 is designed to counter-sink a 1-3/8-inch nail into hard materials, such as oak. The PIN138 also provides the option of using headless and slight headed 23-gauge pin nails from 5/8-inch to 1-3/8-inch in length. The ability to utilize both nails gives the user a choice of keeping nail hole size to a minimum by using headless pin nails or maximize holding power by using the slight head pin nails. The increased holding power from slight headed pin nails provides even more applications to use your pin nailer. Either type of pin nail will save you time by reducing the need for clamping on a particular project or eliminating the need to fill holes due to their extremely small size. Featuring a dry-fire lock-out, the PIN138 will not allow users to fire the tool when there are no nails remaining in the tool. This feature eliminates witness marks (empty nail holes in the material). In addition, a low nail indicator is provided on the outside of the side-loading magazine to alert the user when nails are running low. For added convenience, the PIN138 holds 130 pin nails and automatically adjusts to different fastener lengths to provide easier loading and fewer problems with pin nails that are out of spec. The PIN138 includes additional features that further protect your work surface from being damaged. The tool comes equipped with a rear exhaust, which directs any potential moisture and contaminates away from the work surface. The PIN138 is designed with a narrow nose for improved visibility and features a removable non-marring tip that eliminates wood indentations. An extra non-marring tip is provided and stored on the tool. Plus, a rubberized Porter-Cable logo on the side of the tool provides soft contact if the tool were laid on the work surface. The Porter-Cable PIN138 23-gauge, 1-3/8-inch pin nailer kit includes the PIN138 pin nailer, 2000 headless pin nails, one 1/4-inch plug with cap, one wrench for internal access, and one carrying case. The Porter-Cable PIN138 23-gauge, 1-3/8-inch pin nailer kit is backed by a three-year limited warranty, includes one year of free service and a ninety-day money back guarantee. Amazon.com Price: $20 $15.56 (as of 21/04/2019 08:04 PST- Details) & FREE Shipping. Amazon.com Price: $83.49 (as of 21/04/2019 08:04 PST- Details) & FREE Shipping. Amazon.com Price: $59.90 (as of 21/04/2019 08:03 PST- Details) & FREE Shipping.